"There are so many teams that could win and it will be the team that can execute under pressure; you have to play every game like it's a final in this knock-out format, so we need to step up and do the business". "I think a lot of people came all the way from Fiji to come and support the team". 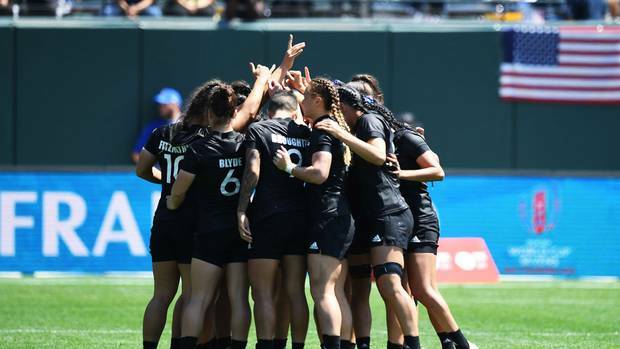 The New Zealand women capped of their destructive run at the weekend exactly the way they began - keeping their opponents scoreless. Meanwhile, Russia beat the Springbok women's side 24-14 on Friday. Woodman's try was similar, finishing off a long string of phases following a break by Sarah Goss. The All Blacks Sevens will face Fiji at 1.02pm Sunday (8.02am Monday NZT). "Extremely proud, not just of this weekend but the whole season, obviously it started off a little bit shaky but to win two pinnacle events in one year I'm extremely proud and very, very grateful to have such wonderful sisters and management around me". "The Irish already played Chile earlier in the day and there was a chance of them catching us cold". Michaela Blyde and Portia Woodman scored two each and Stacey Waaka and Kelly Brazier added two more. In the end, New Zealand prevented the French attack from earning a try or racking up any points on the board. "We had one goal and that was to take the trophy back and I can't wait to go home and show it to the New Zealand public". Conroy announced himself on the world stage at the recent London Sevens but this display against Kenya at the Sevens World Cup further enhances his growing reputation. Should they beat the Scots they'll progress to the semi-final against the victor of the match between hosts usa and England. Kenya, who have reached the semi-finals in the last two Rugby World Cup Sevens, struggled after losing two players to yellow cards, opening the door for a flurry of tries from Scotland before the dramatic finale. South Africa recorded a comfortable 36-5 win over Scotland to progress through to the other semi, where they will meet England, who edged the United States 24-19 thanks to an extra time try from Phil Burgess.